Secretary’s Toilet in German Industrial Factory, c.1974? Some great ideas here. Maybe industrial retro could be extended to this concept. Washed-out colours with strong black frame of intersecting planes suggesting purpose with being demanding. 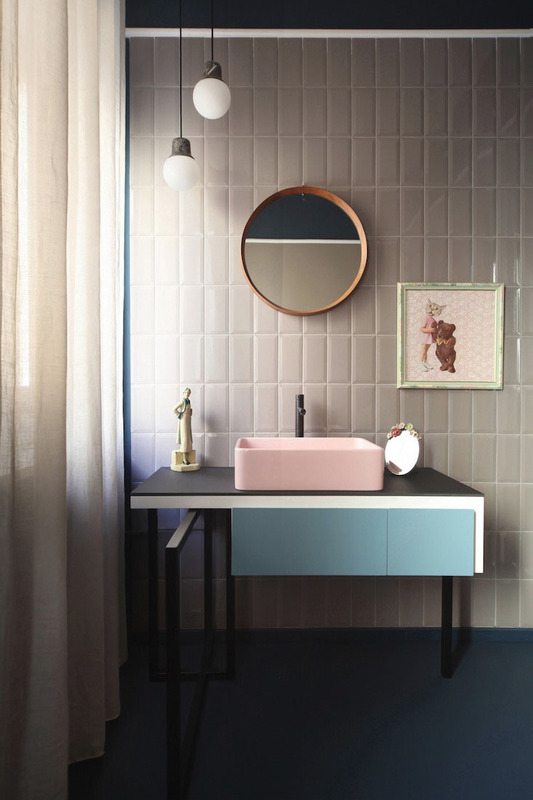 Austere-but-carefully-installed rectangular wall tiles suggest an environment where things are done with care and attention to detail. Still cared for and cleaned without frivolous waste of resources on matters such as renewing the slightly corroded light fittings. The accumulation of artifacts of an ex-domestic provenance which have conspired to merge with their new environment. They know their place; happy to provide a little humour – but are they friends with the fixed pieces of furniture? 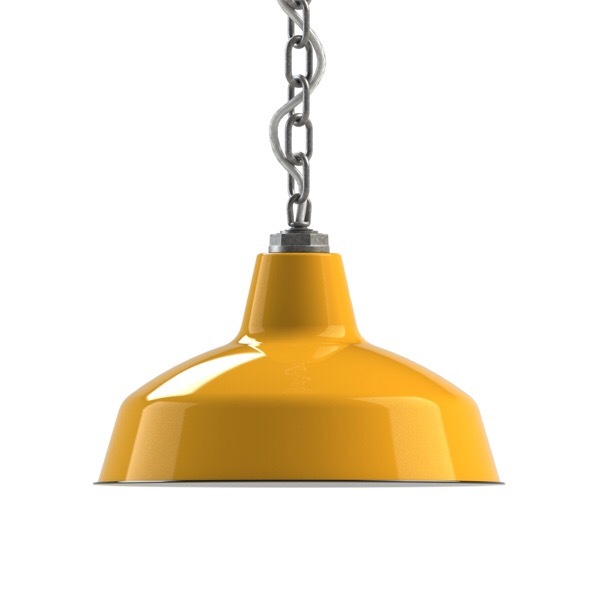 If there’s one thing that we love here at Industrial Retro it’s a carefully constructed combination of industrial utility (the fixing and chain in this example) and a vibrant pop of colour. Boom! What a combination. You can customise with your choice of cord and add an extra vintage flavour with a wire cage. 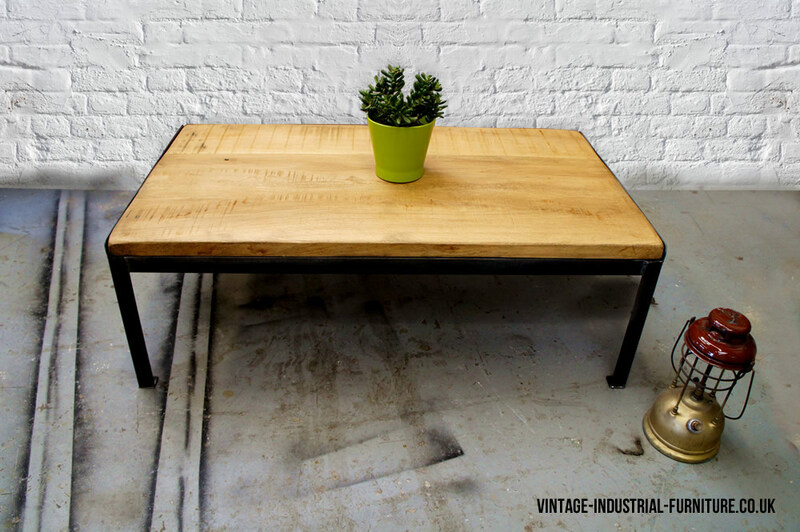 Take a look at this Industrial Oak Dining Table for something unusual. It has a solid oak wooden top, which alone has bags of character, enhanced by a quirky striped detail. The surface is reassuringly level and practical making it easy to clean but still benefitting from a warm, rich feel. The frame is steel and is partly welded and partly bolted together, allowing the legs to be removed for transport and installation. Rigg can make the piece in a variety of sizes making it suitable for small flats to large homes. In fact it would equally be at home in a commercial setting such as a design office or perhaps a more mainstream working environment. 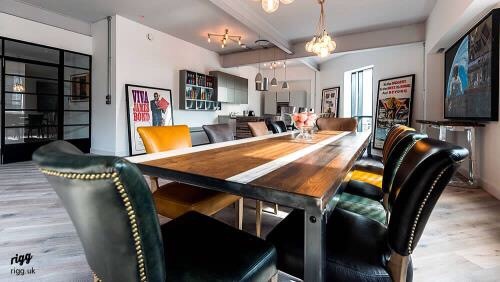 A hint of vintage industrial chic combined with the crispness of glass furniture. 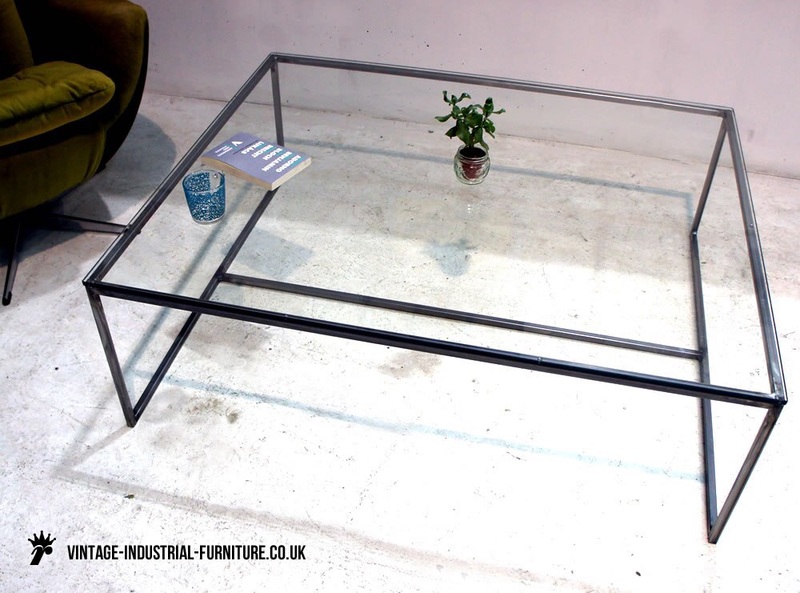 Available in lots of sizes and colours, this glass top coffee table is definitely worth considering. The 15mm tubular frame is elegant but strong. Take a peek at this glass top coffee table on Glass Design Blog. Vintage modern furniture is a great way to bring the past to your home without being “twee”. There is a small post here about vintage modern furniture, focussing on an elegant oak coffee table. The design is crisp and elegant but with an industrial twist. Crisp lines make this vintage industrial desk a wonderful place to work. The upcycled wooden top makes this desk a unique piece and something you’ll want to keep long into the future. Check out this vintage industrial desk now. 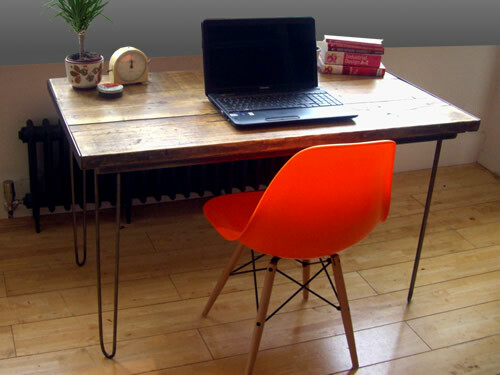 This vintage industrial desk is made by Rigg at their factory in Birmingham, UK. The reclaimed wooden top is waxed and hand-finished to give a warm, satin feel. The colour shown in the photographs is the natural/light colour – A darker, medium brown colour is also available. Check out this vintage industrial cart coffee table. This little gem looks good with its crisp lines and simplicity, but still embodying an aged vintage industrial cart appearance. There are other versions of this type of thing around, but this one is good as it’s made in the UK in Birmingham. The guys at vintage industrial furniture can also do bespoke work.